Top European Union and Iranian negotiators on Tuesday called for a new round of Iran nuclear deal talks to be held June 16-20 in Vienna, after two days of “very long and useful discussions” in Istanbul, the EU said Tuesday. The next formal round of comprehensive deal talks between the P5+1 and Iran will be held from 16-20 June in Vienna, the EU said. An experts level meeting should take place before that, June 5-6 in Vienna, the EU later announced. “Other political discussions will continue as and when needed,” Mann said. As yet this year, the US and Iran have not pursued bilateral talks outside of meetings on the sidelines of the Vienna talks, US and Iranian officials have told Al-Monitor. But Washington appears to be considering doing so as the parties try to conclude a final accord by the July 20th expiration of a six-month interim deal. “New options should be looked into and brought forward,” Zarif told journalists upon arrival in Vienna Monday. Zarif was accompanied to Istanbul by Iran Foreign Ministry spokeswoman Marzyieh Afkham, Deputy Foreign Ministers Majid Takht Ravanchi and Abbas Araghchi, and the head of Iran’s expert team Hamid Baeidinejad, Iran’s Foreign Ministry said. Ashton was thought to be accompanied by Deputy Helga Schmid, chief of staff James Morrison, and nonproliferation advisor Stephan Kllement. Geneva __ A second day of high level of nuclear talks broke for the night here Thursday with Iranian and western negotiators saying progress was being being made in narrowing gaps, but four or five issues still remain to be resolved and need more time. Talks are set to continue here Friday and are very likely to extend into the weekend. There are fewer and fewer gaps between the two sides, “the process is efficient, we have a very deep treatment” of the issues, a senior European diplomat, speaking not for attribution, said Thursday of the days’ discussions. “Some big obstacles [to an accord] have been removed, but not all of them,” the European diplomat said. There are still about four to five elements on the table for negotiation, he said, most of them pertaining to the first phase of the agreement, which is intended to halt the expansion of Iran’s nuclear program over the course of six months while a comprehensive agreement is negotiated. There is “no rupture with the Iranians, but it doesn’t mean agreement tomorrow,” the European diplomat said. “There is a feeling something could happen tomorrow, or after tomorrow,” but there’s no guarantee, he said. If an accord is reached over the next day, P5+1 foreign ministers could possibly come on Saturday. Iranian Deputy Foreign Minister Abbas Araghchi, speaking to Iranian media after the talks Thursday, said negotiations on differences in the text of a draft nuclear accord continue. Given that some of the P5+1 delegations “are to consult with their respective capitals and considering time differences, it may last until morning, so there would be no [further] meeting for tonight,” the Islamic Republic News Agency (IRNA) reported. Among the issues to be resolved concerns language in the text on enrichment, an analyst briefed by negotiators told Al-Monitor. Specifically, he understood, language in the P5+1 proposal given to Iran at the end of the last meeting November 9th would permanently limit Iran’s enrichment, and would never let Iran be treated as a normal member of the nuclear Non Proliferation Treaty (NPT), the analyst understood. Another issue is thought to be a demand on the Arak facility, an issue the Iranians told the P5+1 at the Nov. 9 meeting would not be acceptable, and which remains so now, at least without additional sanctions relief, the analyst said. The Iranians pressed to break for the evening Thursday under the apparent impression that the Americans, who have been consulting with Washington, may be getting further guidance or instructions, the analyst said. The chemistry and conversations with the Americans are positive, but on some issues we are still far apart, an Iranian negotiator described to the analyst. Egypt's military chief announced Wednesday that it was stepping in to transfer power from Egypt's Islamist President Mohammad Morsi to a technocratic government ahead of early parliamentary and presidential polls. 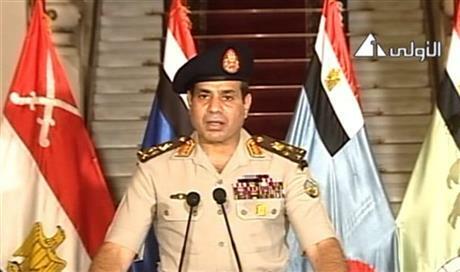 “President Mohammad Morsi has failed to meet the demands of the Egyptian people,” Egyptian army chief Abdel Fattah al-Sissi said in a televised address to the nation Wednesday, al-Arabiya reported. Flanked by Muslim and Christian clerics and opposition leader Mohammed ElBaradei, al-Sissi vowed “not to exclude anyone or any movement” from Egypt's political process. He said Egypt's military did not plan to become involved in politics, but was responding to the demands of the people, as witnessed in some of the largest protests ever seen. But shortly after he spoke, to fireworks and ecstatic cheers of anti-Morsi protesters in Cairo's Tahrir Sqaure, the Muslim Brotherhood's television station “went blank,” the Associated Press reported. Morsi was reported to have been taken to an undisclosed location. A statement on his Facebook page said “that the measures announced by the Armed Forces' General Command, are considered a 'military coup,' …and this is rejected,” Al-Arabiya reported. The “lively forces of the population are the ones who will oust the dictatorship–secular or religious,” the Egyptian official continued. Egyptians did not accept that they have to choose between an autocratic Muslim Brotherhood government or military rule, he said. If they didn't like the next government, he said, Egyptians would take to the streets again and bring it down, too. Morsi's ouster came as the United States had steadily distanced itself from him over the past 48 hours, while insisting that it wasn't taking sides. President Morsi, in a speech Tuesday, “had an opportunity to lay out some specific steps” to show responsiveness to the demands of the protesters, “and he did not take the opportunity to do that,” State Department spokesperson Jen Psaki told journalists at a press conference Wednesday. Meantime, the State Department on Wednesday also ordered non-emergency U.S. personnel and diplomats' family members to leave Egypt, and urged American citizens to defer travel to Egypt due to the unrest. The Saudi King and UAE Foreign Minister both sent congratulations to the Egyptian caretaker government and its appointed head, Supreme Court Justice Adli Mansour. European Union foreign policy chief Catherine Ashton spoke with ElBaradei Wednesday, and “urged all sides in Egypt to return rapidly to the democratic process,” her spokesperson Michael Mann said.